Ty Beic has been called “the epicentre of singletrack” and it is why I moved here. There’s a tremendous variety of great riding within easy reach. Ty Beic is about a 40 minute drive from Coed y Brenin, Llandegla, Antur Stiniog (Blaenau Ffestiniog), Revolution Bike Park (Llangynog), One Giant Leap (Llangollen) and the ClimachX, Gwydir Trails (formally Marin Trail) and Penmachno MTB trails respectively. With so many trail centres within easy reach it’s possible to ride a different one every day in a week and because these trails are purpose built they are well drained and therefore rideable throughout the year. When things get a bit muddy in Surrey the trails will still be clear up here. The websites mbwales and flattyres have lots of information about local rides and natural riding. The roads are quiet. I often cycle for miles without meeting a car. There are challenging climbs and exhilarating descents. Bwlch y groes, the highest road pass in Wales, Horseshoe Pass, the ‘Shelf’, Moel Arthur and Bwlch Penbarras are all within riding distance. Indeed ‘Bwlch’ can be seen from the house. My local cycle club, Clwb Beicio Bala, has rides every Saturday and Sunday and a chaingang on Thursday during the summer. The latter starts and finishes at Bryntirion Arms, the local. If you like your rides organised the Wild Wales Challenge starts and finishes in Bala and there are many other sportives in North Wales throughout the year. Even when it rains round here – and it does sometimes rain – the bikes seem to come back clean rather than covered in the grey greasy grime that I got use to gathering in the years of riding in and around the city. It almost makes riding in the rain pleasurable. I like to run and walk the local trails and will be happy to show you a few routes if you fancy some time off the bike. There are footpaths everywhere, including one through the property. Being on the southern edge of Snowdonia National Park, Snowdon itself is a pleasant and scenic 40 minute drive away. Bala’s mountain, Aran Fawddwy, provides a breathtaking (literally) walk to the summit, especially in winter. There are stunning views from the top of Llyn Tegid (Bala Lake), Berwyn Mountains, Arenig, Cadair Idris and Snowdon. Away from the honey pots of Snowdonia, there are also spectacular walks in the Berwyn mountain range. The walk to Cadair Berwyn from Pistyll Rhaeder is one of my favourites. The websites Mud and Routes and Walk Up Snowdon provide lots of good information including walking guides and skills tips. Bala is also a famous for its water sports. The world renowned National White Water Centre is in Frongoch, Bala. Bala Adventure and Water Sports Centre and Bala Sailing Club are both based on Bala Lake (Llyn Tegid). Bala Adventure and Water Sports offer a range of activities including windsurfing and sailing, kayaking and canoeing, gorge walking and climbing and abseiling. If you like to combine your sports, Bala Triathlon takes place in June. There are also great opportunities for wild swimming in the local lakes and rivers. There is secluded lake just a ten minute walk up the hill from Ty Beic. If cycling isn’t exciting enough, and I can’t understand why you would think this, North Wales has much to offer. Get Wet, down the road in Llandderfel, offers high ropes, white water rafting, gorge walking, paintball, karting and SUP. They claim that the high ropes course is the highest in the UK. Book through their website or pop into their shop on Bala High Street while you’re here. 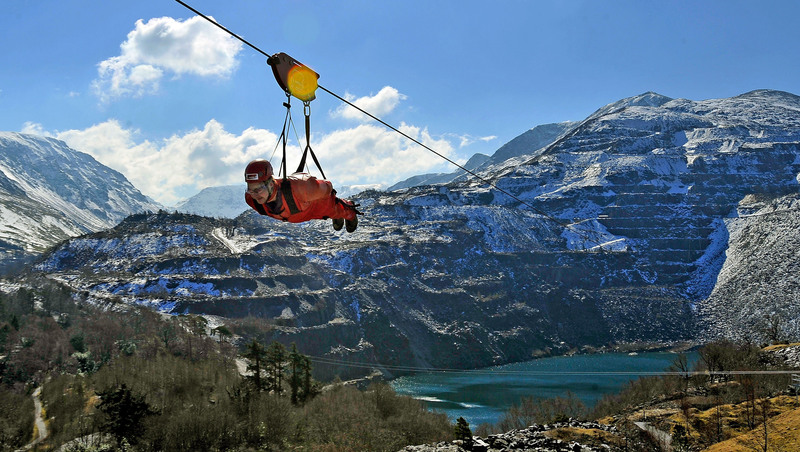 North Wales is also home to the longest zip line in Northern Hemisphere, that’s some claim. Zipworld is in Bethesda and Llechwedd Slate Caverns, Blaenau Ffestiniog. The latter is also home to Bounce Below, huge trampoline style nets in a disused slate cavern. Newly opened is Zipword Fforest– treetop nets, forest coaster (the only alpine coaster in the UK) and zip wires in a woodland setting in the Conwy valley. Surf Snowdonia opened recently and is another first for Wales, the world’s first publicly accessible wavegarden artificial surfing lagoon. It sounds strange to me as well, but whatever floats your boat. There are plenty of places to get your adrenalin fix whether it be climbing, canoeing, kayaking, surfing, swimming, sailing or of course flying down mountains on a bicycle. The local pub is the Bryntirion in Llandderfel. It’s a 10 minute cycle ride there, a bit longer on the way back as it’s uphill. Good local beers, food served every day and a warm welcome. Bala is four miles away and has six pubs, Indian, Chinese and Italian restaurants, Chinese, Fish and Chip, Kebab and Pizza takeaways and numerous cafes. Pale Hall (pictured) is just down the hill in Llandderfel, has recently re-opened after extensive refurbishment as a fine dining restaurant and hotel. The food is excellent and unusually for this part of the world, caters well for vegetarians. Slightly further away (5 miles) is Tyddyn Llan, a Michelin starred restaurant in Llandrillo. For unpretentious and relaxed dining there is Old Wives’ Tales in Corwen (7 miles) and for spectacular views as well as delicious food I would recommend the Lake Vyrnwy Hotel (10 miles away). If you want to cook, Bala has shops which offer local produce including an award winning butcher – T J Roberts. As well as traditional cuts of meat they have a deli counter which offers a very good cheese selection as well as local fruit and veg. Bala also has a Co-Op supermarket, Spar and a number of small, independent shops including one of the best beer and wine shops you will find anywhere. A trip to Wales isn’t complete without a trip to Stori. Both kitchens are fully equipped with everything you need to whip up a quick snack or a slap up meal. There is also a selection of herbs in your garden for your use.